Ink Code is the most advanced iOS application for Chinese Education that is ever published in App Store. It helps you learn writing Chinese as well as reading it. Our brand new algorithm allows you to write with your finger (or an Apple Pencil in case of iPad Pro) on the screen in a super natural way that conforms to the most popular Kaiti writing. Ink Code is available at App Store. 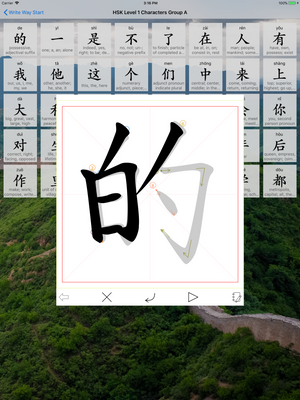 First published in 2010, iLearn Chinese - Read and Write Characters tells the stories behind the origins of Chinese characters, as well as giving beautiful writing demos and allowing users to practice writing characters directly on the device. This app is available at App Store, together with this light version.